How Does a Sales Tax Certificate Work? Did you know that your business can save on taxes by not paying sales taxes on certain products you buy? Depending on the state where you do business and the types of products you buy, you could save from 4% to 10% on state and local taxes for qualified products. The savings come on items your business purchases for resale or components you buy to make something for resale. To get these savings on sales taxes, you must apply to your state for a sales tax certificate. A sales tax certificate may also be called a reseller's certificate, reseller's license, or a tax-exempt certificate, depending on your state. A sales tax certificate is for exemption from sales tax paid, not sales taxes you collect from customers. To collect sales taxes in a state, you must complete a registration process for a state sales tax permit with that state. Let's say you buy products at wholesale prices and resell them at retail price. Or maybe you buy parts and put them together to make products to sell. 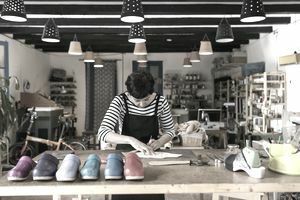 For example, a shoemaker buys component parts used in the shoes she sells; she may be able to buy these parts tax-free by getting a sales tax certificate. When you buy products for your business, you would typically be required to pay sales tax on them. But you are not using them in your business: You are reselling these products at retail price. To avoid paying sales tax, you must file an application to your state to be exempt from sales tax on these purchases. Then, when you buy at wholesale, you must show the wholesaler your sales tax certificate, and you won't be charged sales tax. Most businesses that accept sales tax certificates keep a record of them for frequent buyers; in some cases, you may need to note your certificate number each time you buy. Reseller certificate. These are the type in which, as described above, the products are purchased as wholesale and resold at retail. In some cases, a business buys products which are used in a product being sold. Building contractors are a common example; they buy building materials used in construction. Purchase of these materials might qualify for a reseller's permit. Exemption certificate. A sales tax exemption certificate is for an exemption from sales tax for a specific type of product. For example, some states exempt the purchase of computers for resale. States vary in the products and services that may be considered exempt from sales tax. Some states, like California, distinguish between reseller certificates and exemption certificates. To qualify to be exempt from sales tax, the items you buy must not be used in your normal course of business. For example, you can't buy copy paper and ask for a sales tax exemption, because you are using that copy paper in your office. Some states have limits on the type of products that can be purchased without paying sales taxes. First, go to your state's tax department website. When you get to this site, you may have to do some searching to find the name used in this state for the sales tax certificate. Look for the types of products and services that might qualify for a sales tax certificate. Not all products are eligible in all states. To complete the form you will be asked about your business and about the reason for the exemption. In Iowa, for example, you must first provide basic information about your business (name, address, etc.). Then you are asked to select your business type from a list. Finally, you are asked to check the reason for the exemption, from the list of allowable reasons. In other states, like California, you complete the application form by inserting your own description of the products being requested as being exempt. If you do business in several states, you may have to apply to each of those states to receive a sales tax certificate. First, you need to establish whether you have a sales tax nexus in each state. A tax nexus is a specific way to determine if a business is required to pay taxes in that state. A tax nexus may be determined by having physical locations in a state, selling items in that state, or having employees in the state. To save time in completing several sales tax certificate applications, you may be able to use the multi-state application form from the Streamlined Sales Tax organization. Non-profits can be certified by the IRS as tax-exempt organizations. But this tax-exempt status is only for income taxes; the organizations may still have to pay sales taxes. The state where the non-profit is registered determines whether the organization must pay state and local sales taxes. What is a VAT Tax? What are its Benefits and Drawbacks?